“We are not human doings, we are human beings.” This was one of spiritual teacher Wayne Dyer’s favorite sayings. And he was right – but how often do we remember that simple phrase? In the 21st century, human doing-ness starts practically in the womb . Mothers play Mozart so that their child-to-be stays calm. From birth, the child is stimulated, directed, and encouraged to learn, learn, learn through baby computers and educational toys. What a child is taught in kindergarten wasn’t really on the school roster until first or second grade a generation ago. And as the child grows, there are teams to be on, extra-curricular activities, constant homework pressure and constant testing. If the child goes to college, most will leave with mountains of debt. It may take them years of two jobs to pay back the costs involved in a bachelors’ degree. With employers today expecting more and giving less – fewer benefits, fewer full-time positions, and no loyalty to their employees – the pressure to perform, perform, perform is relentless. Is it any wonder that most people think that sitting and not doing anything is a waste of time, a mark of laziness? Even more, it is surprising that most people don’t really know who they are, except to identify themselves with the jobs they hold? Until we know who we are – inside and out, mentally and emotionally as well as physically – our spiritual self remains hidden. When we take the time to sit, look at ourselves the way one would study a magnificent painting or sculpture, or take in the breathless beauty of a natural setting, then we understand who we are when we are not labeling ourselves according to others’ views of us. When we strive to know all of ourselves – the good and the challenged, the parts that we’re proud of, the parts we want to change, and the parts we really don’t understand in the first place – we are so much more aware of the world entire. We have a better sense of where we fit seamlessly, or where we are pushed and bumped up against people and places very different from us. We own our own uniqueness, and are in turn fascinated by others who are neither better or worse than we are, but different. Curiosity and love for ourselves make us more able to extend that curiosity and love to other people, other experiences. And when we know what we truly bring to the world, we are ready to engage it with joy, rather than fear. Today, set aside all your tasks. Stop trying to fix and improve yourself, or become a better person. Today, take a little time to connect with that which knows nothing is wrong with you, and nothing ever was. Sit with your Self. Let everything around you settle, the way a pool of water clears when the pebble sinks to the bottom. 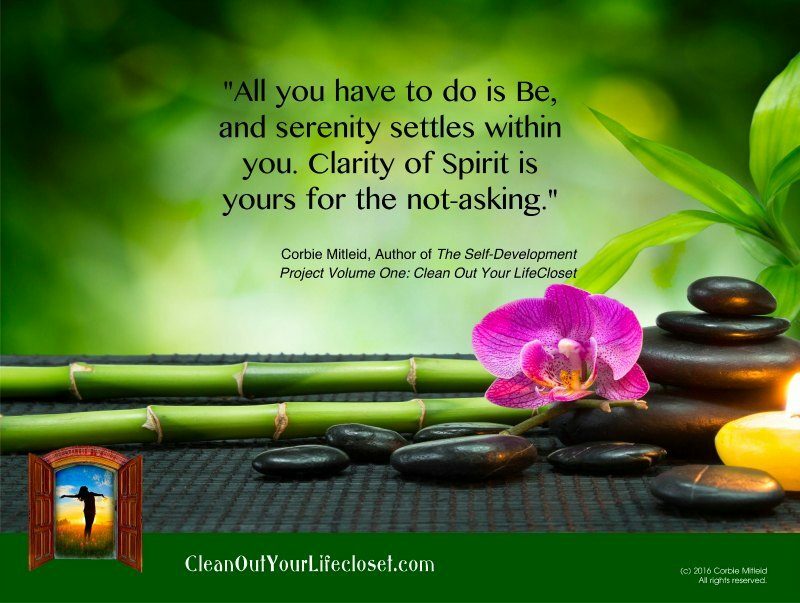 Knowing the self brings Clarity of Spirit in a joyful and adventurous manner. And you will truly understand the delight of being a human being.